Ubak produced a shock in the opening Grade Two John Smith’s Mersey Novices’ Hurdle this afternoon as the 22/1 shot routed the opposition to score by 16 lengths. The Gary Moore-trained gelding was recording his first victory in eight starts and jockey Jamie Moore reckons the five-year-old is improving with every race. “He’s done it nicely and seems to be improving all the time,” said Moore. “Time will tell whether this has been the greatest Grade Two in the world but he’s won it by a mile in the end and looks to be getting better with every race. “Ubak is Josh’s (Moore – Jamie’s brother) ride and he put a lot of hard work into this horse to get him back from Cheltenham but then he got a shoulder injury. 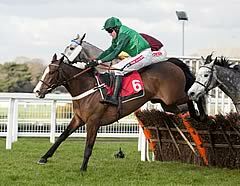 He is good lad and hasn’t had a lot of luck but him and Dad (Gary Moore – Ubak’s trainer) have made this horse decent. It’s Josh’s ride and he deserves this. 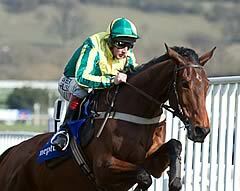 “I rode Ubak at Cheltenham in the Neptune and all the stats will tell you that that is a good race. We made the running but I just got done for toe coming down the hill and that was his first run for months. Utopie Des Bordes posted yet another good performance to stay on for second behind runaway winner Ubak in the John Smith’s Mersey Novices’ Hurdle. A Grade 1 winner over fences in her native France, the five-year-old daughter of Antarctique has won two races in England this season, including a Listed hurdle at Sandown in February. Her trainer Nicky Henderson, one of the few major trainers to race a decent number of mares, said: “She’s a really tough little thing and that was a really good run. You can see she’s not very big but she looks amazing and all you have to do is run her once a fortnight. “It might be tougher for her next year – I’m not keen to run her over fences in England but she could go back and race in France. Seafood proved a tasty option for trainer Dessie Hughes with the Irish-trained 7/1 chance returning to form with his third-place finish. Hughes said: “We are pleased with that as he was wrong at the weights with a few of those in the race. “It is good to see him return to form on this better ground as he has not had his conditions at home during the winter.